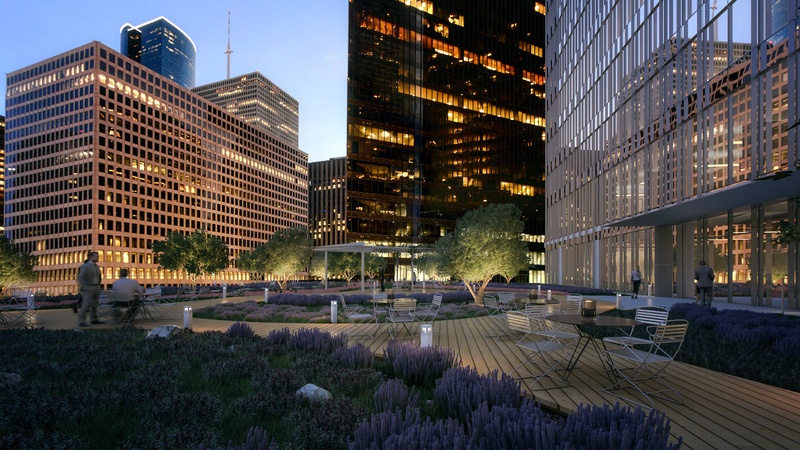 Rendering of rooftop park that will be part of the new Skanska officer tower under construction in downtown Houston. OJB Landscape Architecture designed the park. HOUSTON – A 50,000-gallon rainwater harvesting cistern will be installed – along with a green rooftop park – at the new Skanska skyscraper under construction in downtown Houston. The captured water will be used to sustain the 24,000-SF Sky Park at Capitol Tower, which will be located on the 12th story above street level. OJB Landscape Architecture designed the park, which will be open to all tenants in the 35-story building. The Skanska building is pre-certified LEED v4 Platinum, one of only four core and shell projects nationwide to achieve that level of green certification. The building was designed by Gensler. The tower, the largest office building currently under construction in Houston, will be located on a block bounded by Capitol, Rusk, Milam and Travis streets, will be complete in the first half of 2019. The office tower and garage are connected on that acre-and-a half block. The tower is temporarily named Capitol Tower, until it is officially christened with a Bank of America name of some sort. Bank of America will occupy 205,000-SF of office space in the new building and 5,000-SF of retail space. Warren Savery, Kristen Rabel and Rima Soroka of CBRE represented Skanska in the office space negotiations. The new building will have 754,000 SF of office space and 26,000 SF of retail. The building, 800 Capitol St., will have extensive retail and restaurant space in the tunnel level. The tower is located at a major intersection in the city’s underground tunnel. EDITOR’S NOTE – The exact name of the new tower has not been determined, although it will carry the Bank of America name in some way. A commentary by Realty News Report Editor Ralph Bivins suggested “Bank of America Square.” It makes sense because the building is at the nexus of Houston’s pedestrian tunnel system, with five tunnel connections to the block. So the project will be based in a public square of sorts, although it’s underground. The tower is near the center of the central business district.